The Filson’s Bourbon Salon at Oxmoor Farm series kicked off the 2016 season last night with a talk about “Keeping the Tradition Alive.” Panelists included Peter Pogue of Old Pogue Distillery and Stephen Beam of Limestone Branch Distillery with Michael Veach moderating. Kentucky Peerless owner Corky Taylor was unable to attend because of an emergency. All 3 of these distilleries were started by people whose families had been put out of the bourbon business by Prohibition. 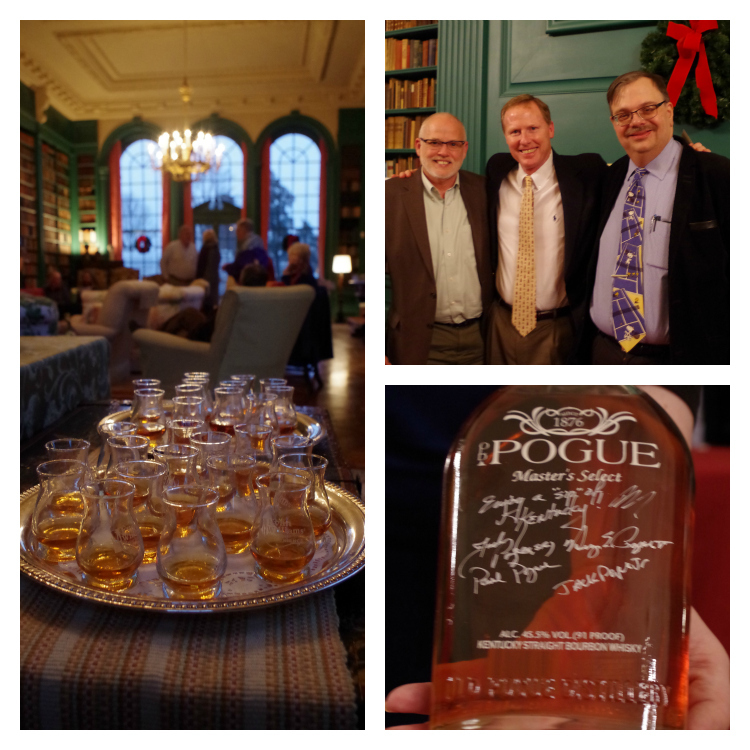 Peter Pogue was given a box of corporate minutes from his great-great-grandfather Henry Pogue’s distillery upon graduation from law school. “The only interesting ones were the ones with George Remus on the board,” he laughed after describing some of his family’s dealings with the notorious Prohibition-era bootlegger. He found some old recipes recorded in the minutes and took them to family friend Sam Cecil, who encouraged him to get back into the whiskey business. It was not an easy decision for Pogue and his extended family; distilling families who had never been in any other business had their livelihoods yanked out from under them by the government during Prohibition. His great-grandfather had made his sons and grandsons promise never to get back into the whiskey business. Old Pogue will release a 4 year old Bottled in Bond Rye this year. Similarly, Steve Beam’s decision to get back into the whiskey business came after he graduated from college, though it wouldn’t come to fruition for many years afterward. Beam’s grandfather had somewhat famously moved to Canada to work for Wathen’s during Prohibition in order to keep doing the only job he knew, though this was not an option for many distilling families. Limestone Branch has recently re-acquired the Yellowstone label from Luxco and has been releasing small quantities of whiskey they sourced from that company while they make their own. Henry Kraver’s Kentucky Peerless Distillery was at one time the second largest distilling company in Kentucky. He had to shut down during Prohibition and spent several years selling off his whiskey stocks before getting out of the business completely. Corky and Carson Taylor decided just a few years ago to bring back their family heritage, locating on 10th Street in Louisville instead of Henderson, Kentucky. They are expected to release their first rye whiskey sometime in the next year or so. Prohibition hurt Kentucky’s economy in ways that are still being felt today. But what’s more, it took the livelihoods of entire families and communities that didn’t know how to do anything else. Kudos to these and all the other folks in Kentucky working to restore our distilling heritage. The next Filson Bourbon Salon at Oxmoor Farm, titled “Brandy: Bourbon’s Older, Sophisticated Sister”, will be held February 23.